House Majority Leader Eric Cantor, R-Va., said Sunday he has "no regrets" after a stunning re-election upset this week at the hands of a primary challenger. The autopsy of Cantor's defeat continued, though, with a number of prominent Republicans saying the Republican leader lost his seat because of his stance on immigration - or his lack thereof. "I don't have any regrets because I remain focused on the mission that I'm about," Cantor told CNN, vowing to continue pushing conservative policies wherever he lands next. He also said he'd vote in the general election for David Brat, the tea party-backed college professor who ousted him Tuesday. "I want a Republican to hold this seat, of course," he said. In a separate interview on ABC, Cantor declined to join the post-mortem speculation about why he lost, saying there wasn't "one particular reason why the outcome was what it was." Cantor's fellow Republicans, though, didn't have too much trouble identifying the culprit: immigration reform. Brat made his opposition to immigration reform and "amnesty" a cornerstone of his campaign, and some Republicans said Cantor lost his job because he was too supportive of immigration reform efforts pushed by Democrats. "Earthshaking primary results in Virginia tonight," tweeted Rep. Steve King, R-Iowa Tuesday after Cantor's loss. "Resounding rejection of #Amnesty and support for Rule of Law." King, one of the House's loudest opponents of immigration reform, later tweeted, "Wanted: Applicants for Majority Leader in US House who have a record opposing amnesty." 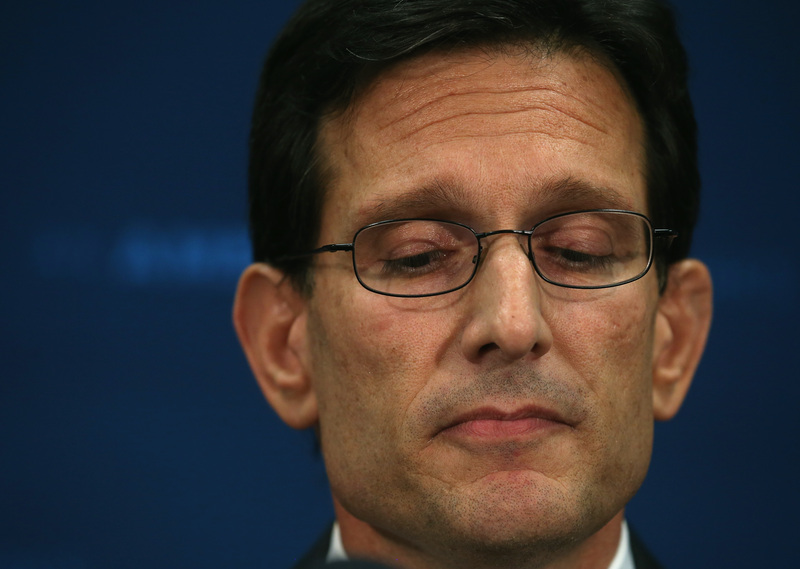 Others, though, said Cantor's mistake was being too vague and too timid on the issue, not too aggressive. Providing a sharp contrast to Cantor's fate, Sen. Lindsey Graham, R-S.C., won his own contested primary this week after openly supporting a comprehensive immigration reform bill that included a pathway to citizenship. He said Cantor lost by muddling the issue, instead of taking a clear position. "I don't think Eric got beat because of his stand on immigration," he said. "I think he got beat because of his lack of defining himself on immigration." Graham advised his fellow Republicans to unabashedly back comprehensive reform, including an earned path to citizenship for undocumented workers, before they become politically obsolete. CBS News congressional correspondent Nancy Cordes said on "Face the Nation" that Cantor's repeated shifts on immigration policy left voters confused. "The bigger challenge for Eric Cantor was not the fact that he was for immigration reform or against it but that people didn't really know where he stood. First he came out very forcefully against immigration. Then he said he was for it for the kids, and then he backed away from that when it looked like that was unpopular," she said. "So I think the challenge for people in his district on not just that issue but a number of issues was that they weren't really quite sure where he stood." Cantor "was never on either side on immigration," agreed PBS' Gwen Ifill. "He tried to have it both ways." Cantor himself didn't buy into the argument that he lost his job because he waffled on immigration. "My position never wavered," he said on ABC. "I have always taken the position that I'm not for a comprehensive amnesty bill. I have always said that we ought to deal with the kids who did not break any laws and themselves came into this country, in many cases, unbeknownst to them." "Did that infuriate folks on both sides?" he asked. "Sure. But it is the principled position." And some other Republicans wondered whether the thorny politics of immigration reform really sealed Cantor's fate or whether something else was at play. Reince Priebus: Despite Eric Cantor's loss, GOP not "divided at all"
"I think it played a role, but again, there are a lot of other issues in this race as well," said Rep. Greg Walden, R-Ore., the chairman of the National Republican Congressional Committee, on "Fox News Sunday." Republican National Committee Chair Reince Priebus argued on "Face the Nation" that Cantor's national profile was a bigger handicap than his position on immigration. "When you're trying to be a majority leader - and Eric did a great job of it - but it takes you out all over this country, it takes you out of your district," Priebus said. "And pretty soon, that good work that you're doing nationally becomes a liability locally."